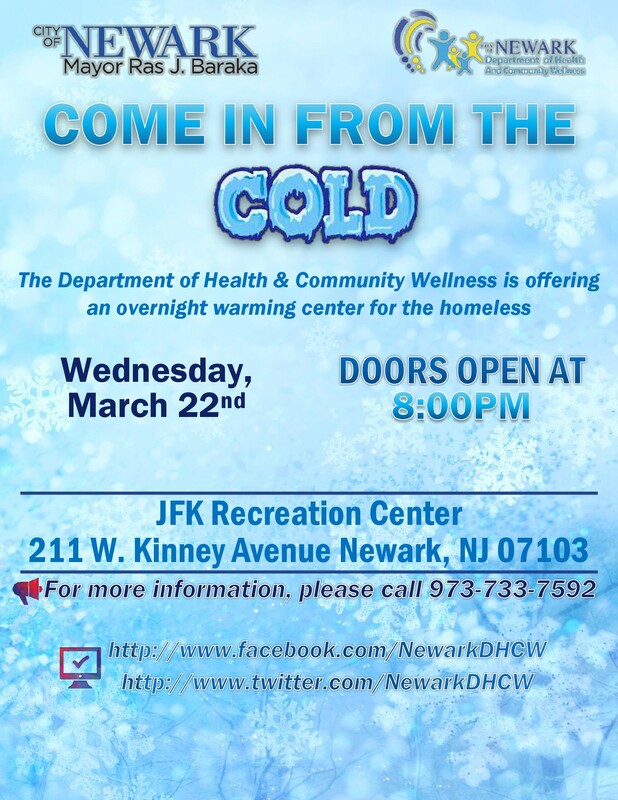 Mayor Ras J. Baraka, the Newark Municipal Council, the Newark Department of Health and Community Wellness and the Office of Emergency Management reminds Newark residents that as cold temperatures impact the region, the City will activate operation of the “Warming Center” for residents as a temporary location of refuge from the bitter temperatures during the harsh weather. The reminder came amid weather forecasts that call for temperatures below 15° degrees. The Department of Health and Community Wellness has been monitoring the weather and based on the monitored forecast, “Code Blue” will be in effect Wednesday, March 22, 2017. The center will be opened on Wednesday March 22, 2017 from 8pm to 8am. The designated location is John F. Kennedy Recreation Center located at 211 West Kinney Street in the Central Ward. Residents who go to the warming center from the cold will be guided by staff to an area where they can get warm. The center will remain open on days the weather is 15°F below. Homeless persons who come to the clinic will be assisted by social workers to get placement in shelters for the night. The Newark Department of Health and Community Wellness reminds residents of the hazards of cold weather. Several layers of warm clothing and protection against moisture and wind are important, even though weather may not seem to threaten cold injury. Gloves and socks should be kept as dry as possible. Insulated boots that do not impede circulation are essential in very cold weather. Warm head covering is particularly important, since 30 percent of heat loss is from the head. 12. Hypothermia can occur when exposed to low temperatures. Your body loses heat faster than it can produce it. Warning signs in adults are shivering, exhaustion, confusion, fumbling hands, memory loss, slurred speech, drowsiness. However, in infants they can be bright red cold skin and very low energy. Take the person's temperature. If it is below 95°, the situation is an emergency. Get medical attention immediately. · Protect your skin from further exposure. If you're outside, warm frostbitten hands by tucking them into your armpits. Protect your face, nose, or ears by covering the area with dry, gloved hands. Don't rub the affected area and never rub snow on frostbitten skin. · Get out of the cold. Once you're indoors, remove wet clothes. · Gradually warm frostbitten areas. Put frostbitten hands or feet in warm water — 104 to 107.6 F (40 to 42 C). Wrap or cover other areas in a warm blanket. Don't use direct heat, such as a stove, heat lamp, fireplace or heating pad, because these can cause burns before you feel them on your numb skin. · Don't walk on frostbitten feet or toes if possible. This further damages the tissue. Inspect space heaters for wear and tear. Check their emergency shut-off features and use only the recommended fuel. Keep combustibles, children, and pets at least three feet away from heat sources. Strap water heaters to the wall, 18 inches off the floor: have gas shut-off in easy reach. If your home has a furnace, have it inspected annually. Store flammable liquids far from heat. Oily rags can ignite without warning. Wash them in detergent and discard. Install at least one smoke alarm on each level of your home. Maintain smoke alarms with monthly testing and new batteries twice a year. Have a licensed electrician check the house’s wiring if lights flicker, fuses blow, or sparks fly from outlets or appliances. Do not overload electrical outlets; check cords for plugs and wear. Keep fire extinguishers labeled 2A-10BC in the kitchen and workroom, and near fireplaces. Cook with the least effective heat; never leave cooking unattended. Do not smoke in bed; install smoke alarms right outside sleeping areas. Have chimneys inspected each year. Burn only dry wood or manufactured logs. Avoid extension cords; never run them under rugs or where they may be pinched. Carbon Monoxide Detectors should also be installed and tested. Plug electric-powered space heaters into an outlet with sufficient capacity and never into an extension cord. Have a qualified professional install stationary space heating equipment, water heaters, or central heating equipment according to Newark’s municipal codes and manufacturer’s instructions. For fuel-burning space heaters, always use the proper fuel as specified by the manufacturer. Never use gasoline in any heater not approved for gasoline use. Make sure the fireplace has a sturdy screen to prevent sparks from flying into the room, and use dry, seasoned wood. Allow ashes to cool before disposing in a metal container, which should be kept a safe distance from the home. For wood-burning stoves, install chimney connectors and chimneys, following manufacturer’s instructions of have a professional do the installation. Follow us on social media stay connected!